Brunello Cucinelli is an Italian luxury and casual-chic brand, which built its success around cashmere clothing. Brunello Cucinelli built its business around the Humanistic Enterprise model which revolves on Italian Craftsmanship, Sustainable Growth, and Exclusive Positioning and Distribution. The company made over €503 million in 2017, mainly driven by its retail channel, which represented 53.7% of its revenues. Italy, Europe, and North America represent the largest markets for Brunello Cucinelli. 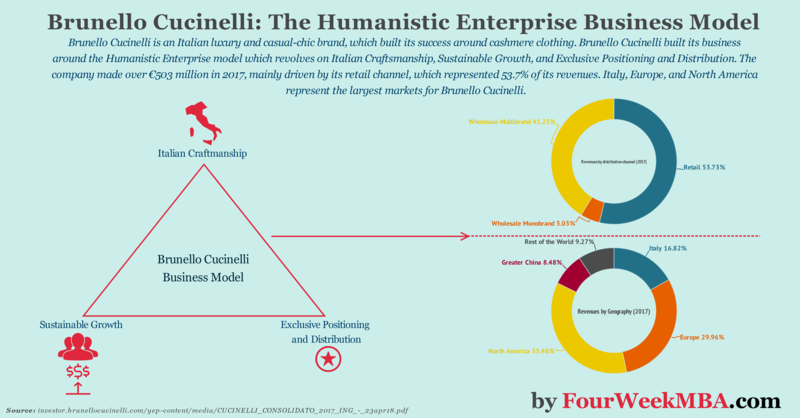 What financial metrics does Cucinelli use to assess its business success? If at all, Cucinelli started his entrepreneurial journey with a mission: to preserve and improve human life via craftmanship. Therefore, his attempt to build a company based on those principles is more of a way to show to the world that philosophy is a critical thinking tool. Just like the ancient philosopher, Thales (about 2,600 years ago) showed to the world he could make a lot of money with his philosophy. Brunello Cucinelli will probably be remembered as the modern version of a philosopher turned entrepreneur. This is not to say that philosophy should be looked at with a utilitarian view. Quite the opposite, whatever road you decide to take philosophy might be a powerful thinking tool that will be worth developing independently from the financial returns it might give you in the real world. Let’s look at the Brunello Cucinelli Empire. In 1978 Brunello Cucinelli started as a cashmere producer. Today Cucinelli is among the most established brands in the luxury and casual-chic brands. The main focus of Cucinelli is on the hand-crafted attention to detail and creativity. The center of the Humanistic Enterprise is the small town of Solomeo, the 14th-century hamlet outside Perugia, home to 400 inhabitants. The company headquartered in a castle is surrounded by a few medieval houses used as workshops. Just like Google has built its innovations labs around the Googleplex, Cucinelli has developed its success around the small medieval town of Solomeo. I believe in a humanistic enterprise: business should comply in the noblest manner with all the rules of ethics that man has devised over the centuries. I dream about a form of humanistic modern capitalism with strong ancient roots, where profit is made without harm or offence to anyone, and part of it is set aside for any initiative that can really improve the condition of human life: services, schools, places of worship and cultural heritage. In conducting its business, the Company acts in a manner compliant with all laws and regulations in force in the territories in which it operates, as well as with the Code of Ethics and Company procedures, which it applies with integrity and equity. The Company guarantees the confidentiality of the personal information and data it processes and the protection of information obtained in regards to professional services rendered. The Company undertakes to provide all stakeholders with a clear and transparent account of its situation and performance, without favouring any group of interests or individual. The Company operates on the Italian and international market in the sale of cashmere knitwear, articles of apparel in leather and other materials, and accessories, and engages in fair competition in the marketplace, complying with Italian and European principles and laws protecting competition. The Company undertakes to promote respect for the physical and cultural integrity of individuals and respect for interpersonal relations. It guarantees working conditions that are respectful of individual dignity and safe working environments and safeguards and promotes the value of human resources, all with the aim of improving and increasing the wealth of skills possessed by each employee. Dealings with the Company’s stakeholders are guided by the principles of propriety, cooperation, loyalty and mutual respect. External relations and employee relations are shaped by the utmost sense of loyalty, which consists in acting with a sense of responsibility. The Company undertakes to be attentive to the market’s changing needs and to constantly improve the quality of its products. The Company contributes constructively to environmental sustainability in all of its activities. The commitment to safeguard the environment is put into practice by planning activities that seek a balance between economic initiatives and essential environmental needs in accordance with applicable Italian and international directives. In its operations, the Company takes account of the needs of the community in which it conducts its business and contributes to promoting quality of life as well as economic, social, cultural and civil development. Brunello Cucinelli S.p.A. is the holding that controls all the other companies spread across the world. Other subsidiaries, like Brunello Cucinelli S.r.l., and Brunello Cucinelli USA Inc. control the companies operating in each country and geographical area. Retail distribution channel: or direct distribution channel, via the directly operated stores (DOS). In certain countries, local operators also have an interest in the Group company running the DOS, to align interests and share their market experience. Wholesale monobrand channel: it consists primarily of monobrand stores operated under commercial distribution agreements. Wholesale multibrand channel: consisting of independent multibrand stores and dedicated spaces within department stores (shop in shop). Those traits together contribute to the long-term vision of Cucinelli growth. Once you have down the mission, vision and the main traits of your brand. It is critical to have a few financial metrics to be able to assess at quantitative level how the business growth is progressing. EBITDA: operating profit before depreciation, amortization and impairment. Net Working Capital: the sum of inventories and trade receivables less trade payables and the net balance (asset or liability) of all the other balance sheet items classified as current assets or current liabilities. Commercial Working Capital: the sum of inventories and trade receivables less trade payables. Net Invested Capital: the sum of non-current assets and current assets, excluding financial assets (other current financial assets and cash and cash equivalents), less non-current liabilities and current liabilities, excluding financial liabilities (current and non-current bank debt, current and non-current financial payables). Net Debt: the sum of current and non-current bank debt and current and non-current financial payables including the fair value (positive or negative) of hedging derivatives on loans, excluding cash and cash equivalents and other current financial assets, including the fair value (positive or negative) of hedging derivatives on loans. Capex: capital expenditures refer to gross investments in intangible assets, property, plant and equipment, and net investments in financial assets. In a global economy that has stressed so much outsourcing and lowering the cost of manufacturing to countries like China and India, to reduce the cost of production, Cucinelli has built an alternative model. This model is built on sustainable growth (profits and people come together) and an exclusive positioning (top end of the luxury segment) and distribution strategy (based on mono-brand boutiques in the main luxury streets and to prestigious multi-brand boutiques and Luxury Department Stores). With over €500 million in sales in 2017, Cucinelli makes money via three main distribution segments (Retail, Wholesale Monobrand, Wholesale Multibrand). Retail represented 53.7% of total revenues in 2017, compared to Wholesale Monobrand with 5% of the revenues, and Wholesale Multibrand at 41.3%. At geographical level, the most significant countries were: Italy which represented 16.8% of its revenues in 2017, North America which represented 35.5% of its revenues and China, which represented 8.5% of its revenues.